The Pug is also known as the ‘Carlin’, ‘Mops’ (the name of Marie Antoinette’s Pug), or ‘Chinese Pug’. ‘Pug’ derives either from the Latin for ‘fist’ (referring to the Pug face’s resemblance to a clenched fist) or the Old English ‘Pugg’ for ‘playful little monkey’ (deriving from ‘Puck’, as in Shakespeare’s ‘A Midsummer Night’s Dream’). Unlike other toy breeds, the Pug descends from mastiffs. It was originally bred as an Emperor’s pet in China during the Shang dynasty (1766-1122 B.C.) and became a popular pet for Tibetan monks. 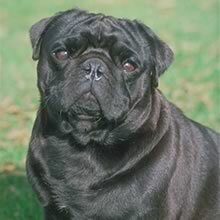 Pugs were imported to Holland by the Dutch East Indies Trading company, where one saved a Prince’s life by barking at an assassin, and a Pug later accompanied King William III of England on his journey to claim the throne. Napoleon Bonaparte’s wife Josephine had a Pug named Fortune, which she used to deliver messages to Napoleon while in prison in 1794, and in the late 1800’s Queen Victoria had many favored Pugs which she bred personally. In addition to their extreme popularity as pets, Pugs served as guard dogs, scent hounds, and fashionable coach footmen. In short, Pugs have done just about everything short of delivering the Gettysburg Address. They were recognized by the American Kennel Club in 1885. Famous Pugs include ‘Frank’ from ‘Men in Black’ and ‘Odie the Talking Dog’ from David Letterman, who won ‘Top TV Moment of 2004’ from America Online. The Pug has a shoulder height of 35 cm (14 in) and weighs about 7 kg (15 lbs). It has a large, spherical head with big eyes, small ‘rose’ (folded toward the muzzle) or ‘button’ (folded at ninety degrees) ears, slight underbite, deeply wrinkled forehead, and a distinctly short, square muzzle. Pugs have a compact, muscular body with arched neck, deep chest, and tail curled tightly over the back. Pugs are easygoing, straightforward, sociable, intelligent and calm. The Latin phrase ‘multum in parvo’ (much in little) is often used to describe the Pug’s huge personality contained in a small body. Pugs are easygoing, straightforward, sociable, intelligent and calm. The Latin phrase ‘multum in parvo’ (much in little) is often used to describe the Pug’s huge personality contained in a small body. The Pug gets along well with children, other dogs, and any household pets. It has a high socialization requirement and may get jealous if ignored by its owner. Pugs are lovable lap dogs who like to stick close to their owner’s side. Most Pugs wheeze or snore. You can find Chinese Pug puppies priced from $200 USD to $4000 USD with one of our credible breeders. Browse through our breeder's listings and find your perfect puppy at the perfect price. The Pug gets along well with children, other dogs, and any household pets. It has a high socialization requirement and may get jealous if ignored by its owner. Pugs are lovable lap dogs who like to stick close to their owner’s side. Most Pugs wheeze or snore. The Pug should have loose hairs removed periodically with a rubber brush. A special lotion must be applied to the facial creases. The shape of the Pug’s face makes it susceptible to eye injuries and scratched corneas, as well as breathing difficulties. Pugs are also susceptible to obesity, which makes exercise and a healthy diet important. The Pug has difficulty dissipating heat and should never be left outside in hot weather or locked in a car without air conditioning. The Pug is also prone to breed-specific Encephalitis known as (PDE). The Pug may ‘reverse sneeze’, which is a fit of gasping and snorting to remove fluid caught under the palate. This is not dangerous, but may frighten the Pug and its owner; it should be handled by talking to the Pug calmly and gently rubbing its throat. The Pug has a lifespan of 12-15 years. It is necessary to be gentle when training the Pug, as it is very sensitive to the tone of is master’s voice. Pugs are sometimes stubborn but do well with obedience training. Chinese Pug Puppies for Sale - Shipped Worldwide! Finding the right Chinese Pug puppy can be dog gone hard work. PuppyFind® provides a convenient and efficient means of selecting and purchasing the perfect Chinese Pug puppy (or Chinese Pug puppies) from the comfort of your home, 24 hours a day, 7 days a week. Take advantage of our PuppySearch or leisurely browse our directory of hundreds of dog breeds, Chinese Pug dog breeders, Chinese Pug dogs for adoption, and Chinese Pug puppy for sale listings with photos and detailed descriptions. Some Chinese Pug puppies for sale may be shipped Worldwide and include crate and veterinarian checkup. Many Chinese Pug dog breeders with puppies for sale also offer a health guarantee. With thousands of Chinese Pug puppies for sale and hundreds of Chinese Pug dog breeders, you're sure to find the perfect Chinese Pug puppy.